If you answered 1 or 2, well… you must not know ’bout me, because there’s no way I’m making something that complicated on a weeknight. It is, however, probably the best chocolate pudding I’ve ever had. In a saucepan, combine dry ingredients. Add milk and water; stir or blend until smooth. (I used a stick blender.) Cook over medium heat, stirring constantly, until mixture comes to a boil. Cook until desired pudding-like consistency, anywhere from 1-5 minutes. Remove from heat. Taste. If you feel it’s a a little lacking, stir in extract. Cool to room temperature, stirring (or blending) several times. Eat while still warm and/or refrigerate uncovered (if you are a fan of pudding skin) or lay a piece of plastic wrap or parchment on the surface (if you are no fun at all). ← I now enter Phase II of Learn to Bake. Granted, the recipe I use is from my Better Homes and Gardens red-and-white checked cookbook, which I don’t have on hand, but I don’t remember pot de creme being much more complicated than that. Melting chocolate rather than using cocoa powder, I guess. I haven’t made them for a while, but they’re in my “easier than you’d think” category. Yum! Pudding is one of those things I like but forget to make. And this uses evaporated milk which is one of those things I keep buying and never using. Cheryl: I really just like saying pot de creme, but now I’m gonna have to look up how you actually make it. Rachel: At the risk of sounding crazy, I love evaporated milk. I drink it in my coffee, so I always have an open can in my fridge. Basically, I use it in anything that calls for a small amount of milk or cream — mac & cheese, creamy soups, etc. I really need to start using it more. I think I just forget about it but I have like 6 cans in cabinet! Well I voted for pot de creme because it looks just like the luscious one I ate recently- but your recipe looks so good and easy, so I hope to try it out this week. 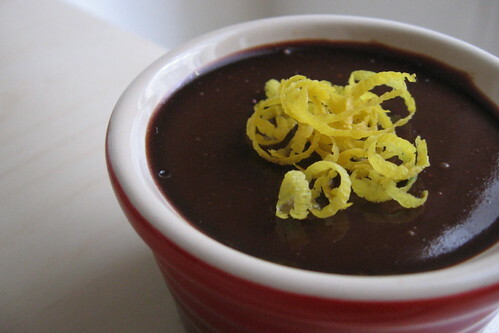 Savor pot de creme (poh-duh-KREM), a very rich dessert, in small portions. In a heavy small saucepan combine light cream, chocolate, and sugar. Cook and stir over medium heat about 10 minutes or until mixture comes to a full boil and thickens. Gradually stir about half of the hot mixture into beaten egg yolks,; return yolk mixture to saucepan. Cook and stir over low heat for 2 minutes more. Remove from heat. Stir in vanilla. Pour into 4 or 6 pot de creme cups or small dessert dishes. Cover and chill for 2 to 24 hours. Serve with whipped cream, if desired. Makes 4 or 6 servings.